We are continuing our Breast Cancer Awareness campaign beyond October and are sponsoring the Dubai Women’s Run as the proud Bronze Sponsor of the event! We are very excited to be running altogether in this meaningful event to celebrate the spirit and empowerment of womanhood! 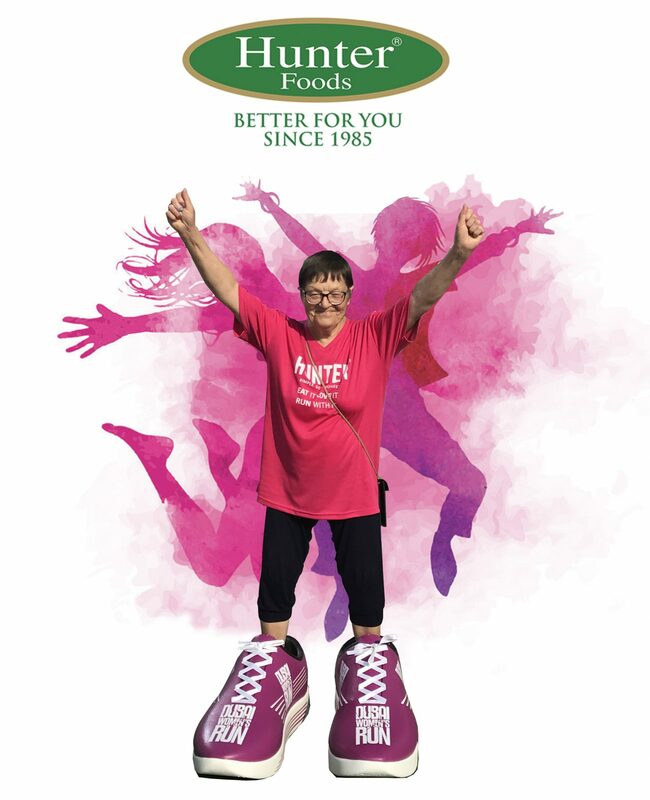 Hunter Foods team has almost 200 women, aged 14 to 76 years’ old, from various cultural backgrounds and walks of life. Being less than 10 days away from the run we need to start prepping the body….. Whether you will run 5K or 10K, here are our tips below, and see you at the start line at Dubai Festival City on the 16th of November! Hydration, hydration, hydration……… water is best, avoid carbonated/fizzy drinks and sugar loaded drinks. If drinking juice stick to fresh squeezed fruit juice and only 250ml for the day. As you get closer to race day liquid levels should be increased. Meal prepping is not only for professional athletes or celebrities…… below are some guidelines for healthy eating leading up to your race and beyond. Building energy levels with better for you carbs, Hunter’s Gourmet White Quinoa or Tri-Color Quinoa are great options at any meal, able to be used in salads or warm dishes it is the perfect high carb option. Breakfast ‘carbing’ can be managed with a serving of Lizi’s Granola, adding 5gm (1 teaspoon) of Hunter’s Gourmet Chia Seeds, 5gm (1 teaspoon) of Hunter’s Gourmet Flax Seeds & 5gm (1 teaspoon) of Hunter’s Gourmet Cocoa Nibs, mix this together with a 1Ž2 cup of Full Fat Greek Yoghurt, this will balance your breakfast to cover all required minerals and vitamins for a great start to the day. Good digestive health is also important an can be achieved with a healthy shot of 5gm (1 teaspoon) of Hunter’s Gourmet Wheat Grass powder dissolved into 35ml to 50ml of water or your favorite freshly squeezed juice. FATIGUE PLAYS A MASSIVE ROLE DURING THE RUN. Start ramping down your exertion levels closer to race day, this will assist you too remain strong during the run and be less fatigued. The day before the run should be limited to foam rolling stretching and brisk walk or comfortably paced run. Another factor related to fatigue is sleep, try for at least 7 hours of sleep per night and 8 the night before the race. Meal plans leading up to race day should be simple, but maintain all of the complex food groups. Protein, Carbs & Fat are very important and should be well balanced throughout each meal. Leading up to race day where a good carb driven dinner with high levels of protein can be consumed, consuming a high Carb meal the night before the race assists in building energy levels to carry into the early morning race. SNACKING IS NOT A BAD THING. In moderation…….. controlled snacking between meals is very important to keep the system going and in most cases is a must to sustain energy levels throughout the day and work to prevent fatigue. 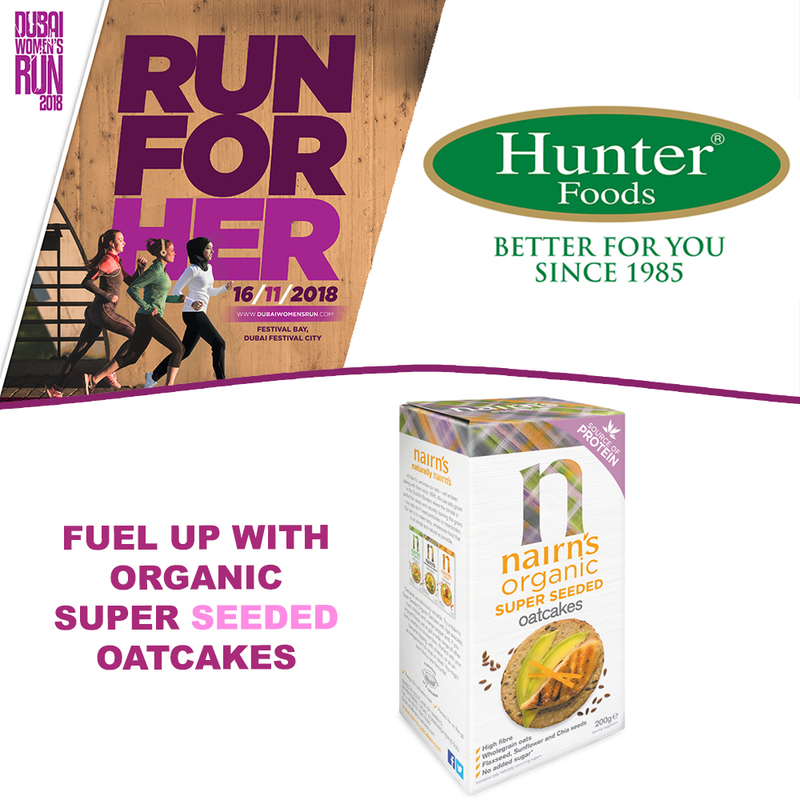 Hunter’s Gourmet Cereal Cakes, with some high quality nut butter are the perfect snacking product, easy to carry & easy to snack on. 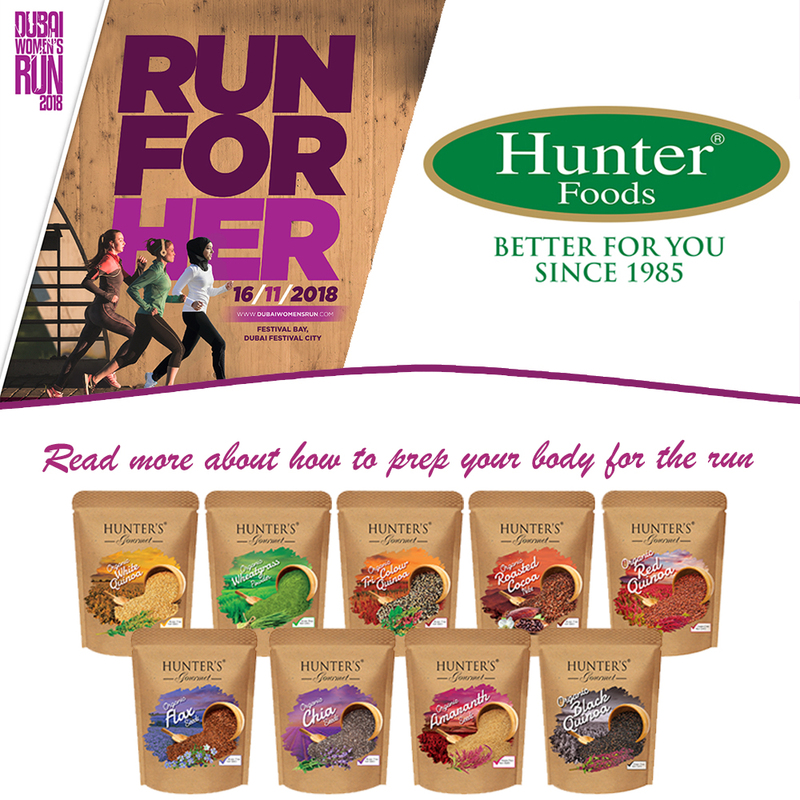 Other options for a quick snack include the Hunter’s Gourmet Mixed Vegetable Chips, Mixed Fruit Chips & Beetroot Chips. However, snack meals can come in all forms, a nice pot of Hummus with a handful mixture of Hunter’s Gourmet Wholegrain Corn Chips, would make the ideal on the go lunchbox snack. OUR MOST IMPORTANT MESSAGE FOR RUNNING, OTHER THAN MEAL & HYDRATION PREPPING, IS COMFORT. Have you ever looked at ‘consistent exercisers’? They always have comfortable equipment. From the shoes to the clothing to the hairband, hat and glasses, added to that music. This doesn’t mean going out and spending 100s or 1000s of Dirhams on fancy equipment. It just means being and feeling comfortable while running. Do not wear new shoes for your run this could result in an experience you will not enjoy. If you do not enjoy the experience, you will probably not do it again. HAVE FUN AND HAVE A GREAT RUN! Visit Dubai Women’s Run website to have more information on the race kit collection, race course and parking area.